TALKING MOTORIST SAFETY at the trio of Cottonwood County Road access points to Minnesota State Highway #60. From left, Cottonwood County Engineer Nick Klisch, Minnesota State Patrol Sergeant Ron Richards, Minnesota Department of Transportation District #7 Traffic Safety Engineer Scott Thompson, Cottonwood County Board of Commissioners Chair (from District 5) Tom Appel, Mountain Lake Mayor Mike Nelson and Fourth District Cottonwood County Commissioner Norm Holmen. 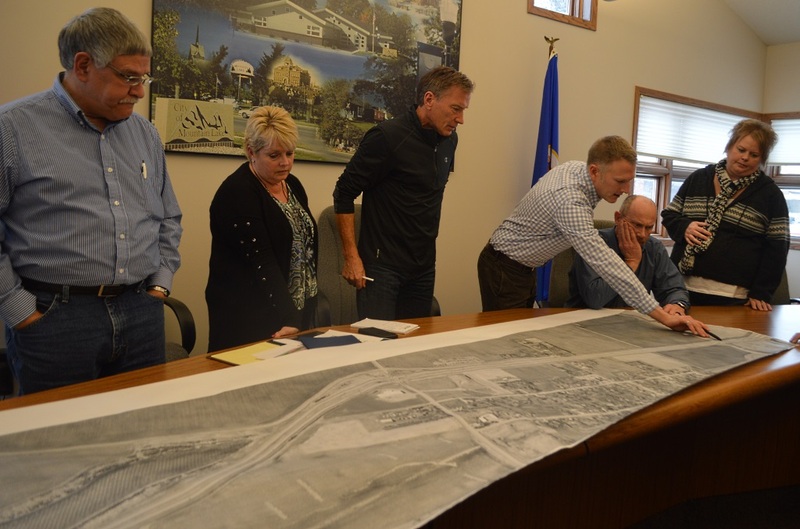 MOUNTAIN LAKE CITY Council and Cottonwood County Board of Commissioners members gather around Thompson’s full concept sketch of RCUTs at the three Cottonwood County Road access points to Minnesota State Highway #60. From left, Cottonwood County Board of Commissioners Chair (from District 5) Tom Appel, Mountain Lake City Council Member Dana Kass, Mountain Lake Mayor Mike Nelson, Minnesota Department of Transportation District #7 Traffic Safety Engineer Scott Thompson, Fourth District Cottonwood County Commissioner Norm Holmen and Mountain Lake City Council Member Darla Kruser. EXAMPLE OF AN RCUT for Cottonwood County Road #1 access to Minnesota State Highway #60. This afternoon’s (Thursday, January 4) meeting in Mountain Lake City Hall, originally billed as a preliminary meeting between city, county and other officials to begin the discussion about options to improve the safety of motorists at the three Mountain Lake intersections with access to Minnesota State Highway #60 (Cottonwood County Road #27 at the east and west exits and Cottonwood County Road #1 in the center), expanded to include other interested parties – from a local business owners to emergency responders to the city’s economic development director to city and utility employees to the general public. On hand to lead the talks about possible safety preferences were Scott Thompson, Minnesota Department of Transportation (MnDOT) District #7 Traffic Safety Engineer and the Minnesota State Patrol’s Sergeant Ron Richards. Also at the dais were Cottonwood County Board of Commissioners Chair (representing District 5) Tom Appel, Fourth District Cottonwood County Commissioner Norm Holmen, Cottonwood County Engineer Nick Klisch, Mountain Lake Mayor Mike Nelson and Mountain Lake City Council Members David Savage, Darla Kruser and Dana Kass. Klisch had first approached Thompson with concern and looking for solutions to the city’s three intersections with access to Highway 60 due to safety issues, i. e., the number of accidents and the severity of the crashes. At the County Road 1 intersection with Highway 60, 20+ accidents have been noted in the past 10 years, while at the east County Road 27 access, four crashes have occurred and at the west County 27 connection, three have happened, including one with a fatality. Thompson noted that he was on hand to gather the observations and concerns of city and county officials, as well as others in attendance, as well as review and present possible answers to the motorist safety issues. Safety improvements at the trio of highway access points will become even more crucial when the final four-lane stretch of “60” (from Mountain Lake to Windom) is finished next year. Following that completion, Sergeant Richards, who has served this area for 23 years, noted that traffic will increase heavily; with expectations of an uptick in truck traffic alone projected at 15% to 20%. Thompson echoed those comments, stating that 80% to 85% of the crashes at the crossing are of the T-bone variety, including three in 2017 and two in 2016. 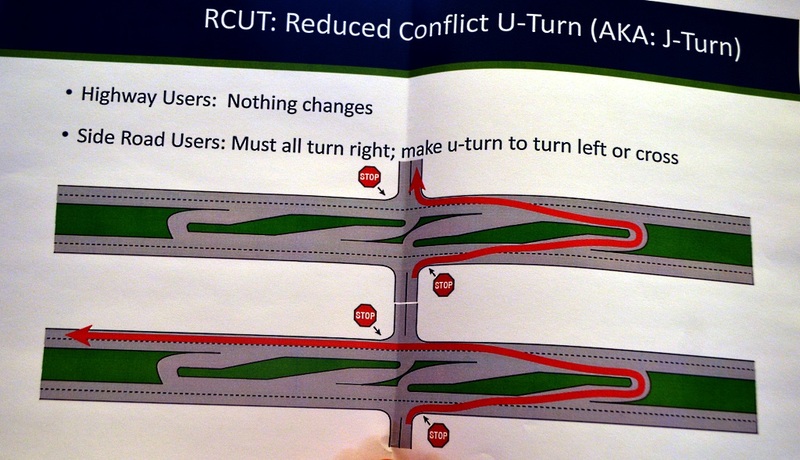 Creating a RCUT (reduced conflict U-turn) – or J-turn or – RCI (reduced conflict intersection) at the three intersections (at a cost of from $800,000 to $1.2 million for each). Building an interchange (at a cost of approximately $10 million) or an overpass (for $6 million) at County 1 (which would most likely result in the closure of the east and west highway access roads). Setting the speed limit lower through the area. Using better or different signage. Additional alternatives raised in discussion for use at the east and west access points were acceleration or deceleration lanes, along with stoplights at the intersections. With the construction of the Mountain Lake Commercial Park along the highway’s west access, the closing of that intersection was eliminated from consideration. Setting lower speeds, inserted Richards, is “an enforcement nightmare that could cause more problems, including sideswipe and rear end collisions,” and added that stoplights, too, would be a highway nightmare and an automatic congestion point. “Highway 60 is designed as a non-stop highway between Omaha, Nebraska and Minneapolis,” Richards emphasized. Thompson’s full concept sketch includes an RCUT at each of the three access points, noting that the RCUT is a new tool in the MnDOT toolbox. Despite that, he is looking for input from local users of the roadways and is ready to make accommodations – both funding wise and safety wise. Concerns were raised on the “exposure time” for farm equipment using RCUTS. Continuing, Thompson explained that MnDOT had commissioned the State of Iowa to study if ag equipment had been involved in accidents at a higher level at the state’s numerous RCUTS. (Iowa has long instituted the creation of RCUTS). The study reported that ag equipment was under-represented in accidents. Thompson said that he believed that is because, when using an RCUT, crossing is divided into two pieces – with two unique decision points. If RCUTS are deemed the solution, money for the project would be pulled from the state’s Safety Fund, not the Highway Fund. The Safety Fund provides $1.2 million each year to improve the safety access at intersections with sustained crash rates. As current RCUT plans presented are on MnDOT property, 100% of the cost would be the responsibility of MnDOT. If approved, summer 2020 would be the construction target date. Project work would be done with lane closures, with one access to Mountain Lake always maintained during that time period. MnDOT is in the process of collecting traffic counts at all three intersections. Sergeant Richards inserted that MnDOT and the Minnesota State Patrol are working together to set Mountain Lake up for the future; for the next 20 to 30 years. Thompson emphasized to those attending the meeting that MnDOT is backing away from expansion mode to “preservation” mode due to lack of revenue. 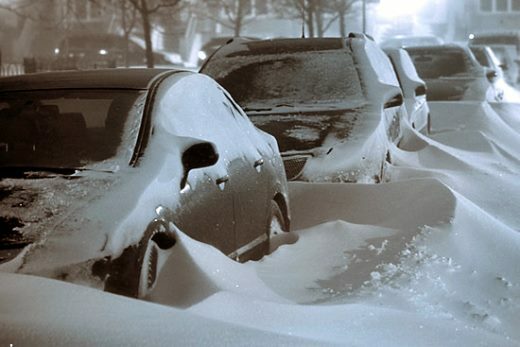 A joint Mountain Lake City Council/Cottonwood County Board of Commissioners will be scheduled, at which time traffic counts and accident counts and causes will be presented, along with information from the Iowa study, to be followed by a public meeting. RCUTS are intersections on multi-lane highways. They allow drivers to turn right from the smaller, local roadway onto the higher speed road and make a u-turn at a nearby opening in the median. They prohibit drivers from making left turns onto the highway. According to the MnDOT website, RCUTS are designed to increase safety, decreasing “T-bone” (or right-angle broadside) crashes, such as that have occurred at the intersection of the four-lane divided Highway 60 and the two-lane County 1 at Mountain Lake. These accidents occur when motorists either attempt to cross all four lanes of traffic or make a left-hand turn. (A typical four-lane divided highway intersection has 42 possible vehicle conflict points, and with RCUTS, those conflict points are reduced to as few as 18). A new safety study released by MnDOT last June hows that the state’s RCUTS (13 throughout Minnesota) are saving lives. The study shows that the eight RCUTS studied in Minnesota had a 100% reduction of fatal and serious injury right-angle crashes, a 77% reduction of all severity right-angle crashes and a 50% reduction of injury crashes. The state has five other RCUTS, not included in the study, and those intersections have not had a serious injury nor fatality since construction. The first RCUT completed by MnDOT was built in 2010 at Willmar. RCUTS are also faster to build. They can be designed and built in approximately one year, while interchanges typically take between three-to-five years. RCUTs are also often less expensive than a stop light – and are a fraction of the cost of building an interchange. At a traditional intersection with a four-lane divided highway, motorists from the side road need to look in both directions in order to cross. Left turns require the same level of attention. With an RCUT, drivers from the side road only have to be concerned with one direction of traffic on the highway at a time. There is no need for motorists to wait for a gap in both directions to cross a major road. The 10th Street (Jackson County Road 9) intersection has an above average number of crashes; most of which are right-angle/T-bone type crashes. These crashes carry a higher likelihood of serious injury or death. Two of the right-angle crashes that have occurred recently have resulted in three fatalities. Only addressing the problem at 10th Street could result in the problem being relocated to the other intersections that serve Heron Lake, which is why all three intersections are being treated. Construction is slated for 2019 at a cost of $2 million to $3 million. Motorists approaching a four-lane divided highway from a side road cannot make a left turn or cross the lanes of traffic. Instead, motorists are required to turn right onto the highway, then make a U-turn at a designated median opening. In an RCUT, drivers always make a right turn – followed by a U-turn. This reduces potential conflict points and increases safety.